Due to changes in the insurance industry as a result of Affordable Care Act regulation IHS Insurance Group is no longer able to offer Marketplace Health Plans. Please see our “Resources” tab and click the link to the healthcare.gov website if you care to apply. As the year draws to a close the team here at IHS Insurance Group is looking forward to a new year of hard work and success together! 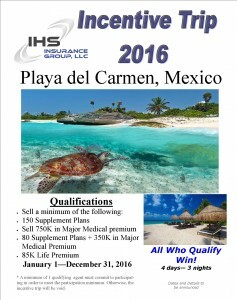 For the second year IHS Insurance Group is offering its employees the opportunity to qualify for an incentive trip to a luxury destination. The 2016 Incentive Trip will be in . . .